As those of you who know me are aware, I’m a bit of an amateur WWII historian. I have a large bookshelf filled with tomes on the subject, and while my sphere of curiosity has always centered on the Eastern Front, any film which remotely covers the conflict goes to the very top of my must-see list. So it was with this film as I planned my Fest schedule. “Emperor…” follows in the old tradition of dramatizing very specific events from the war with as much attention to insider detail as possible. 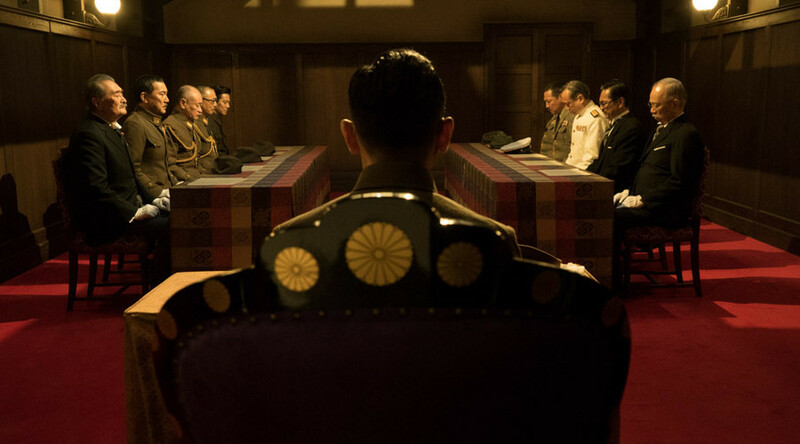 In this way, “Emperor” acts as the Japanese version of the German (and highly memed) film, “Downfall”, as it painstakingly takes you through the final few days of the Imperial government before its’ surrender. What worked so well in “Downfall,” – namely, that we observed Hitler’s demise through the eyes of his closest confidants – is what makes “Emperor…” work as well. In this case, the newly appointed Prime Minister (played with curmudgeonly glee by Tstomu Yamazaki) and the “damned if he does, damned if he doesn’t” leader of the Army (played with multi-dimensional prowess by the always amazing Koji Yakusho), along with several other minor characters, act as our eyes and ears as we sit in on the decisions that would shape modern Japan. Now, this could easily fall in to History Channel tedium in the wrong hands, but Harada, who was a noted social critic of Japan’s culture prior to becoming a director, manages to shape it in to something beautiful and suspenseful. We learn, for instance, that there were several reactions to the decision, by both the government and the military, that could’ve changed history in extraordinary ways (good or bad) for the country. As a result, the countdown to the end grows in tension, instead of slowly wending its way toward an already known finality. The photography is, as you would expect, absolutely stunning and breathtaking in many ways, none more so than its use of the cherry blossoms in full bloom in one memorable scene, petals drifting in the air as a car flies through them. The script drifts in a very similar way…never rushed, always important, and very hypnotic. The score is, well, it must have been effective because I have no memory of it whatsoever, and, like an effective referee or umpire, that is sometimes the best thing you can say about it. To sum up, it’s pretty great. Will you enjoy it if you don’t care about WWII history? Maybe. Maybe not. But I think it stands up on its own as a wonderful film. And, with the hindsight of knowing the eventual consequences of every player’s decision, “Emperor…” becomes an extremely important addition to the canon of Post-War dissertations.